How Can You Make Your House A READING HOUSE? I have formally taught and tutored many different types of readers over the years: new readers, struggling readers, uninspired readers, and those that I like to call classic readers (fast learners). Their instructional needs are very different but they all have one thing in common … parents who want to help them become stronger readers who do well in school. These parents approach me regularly asking for suggestions. They explain that they know they should be reading with their children at home, but want to know what else they can do. Well, first, here’s the good news. If you are reading to your child on a daily basis, then you are already doing the single most important activity that will contribute to your child’s future academic success. Don’t worry that it feels too simple to be all that powerful. The advantages of frequently reading to – or with – your child cannot be overstated. It’s immediate on-the-job training! Reading together stimulates language and cognitive skills, enlarges the vocabulary base, builds prediction and memory skills, strengthens comprehension, and so much more. The second bit of good news for those attentive parents is that – yes – there are many other fun ways to practice reading with your children at home. In response to their requests, I have developed a plethora of reading games and routines that can easily be woven into a family’s busy day. 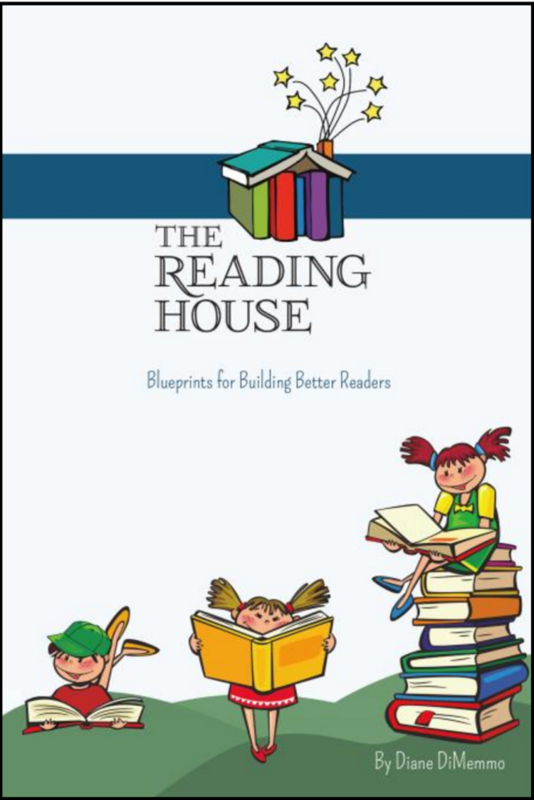 In my book, THE READING HOUSE, there are learning experiences for children from birth through fifth grade that touch upon language development, phonics, book selection, loving literature, reading strategies, vocabulary, comprehension, and story extensions. 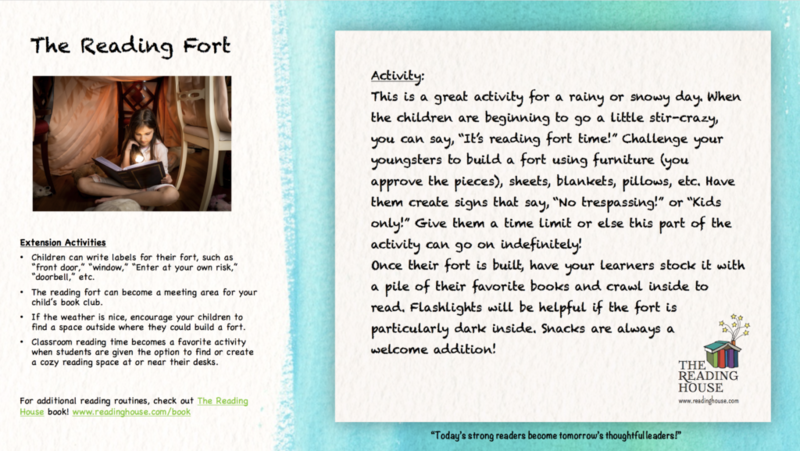 These reading activities are super simple and loads of fun, written expressly for parents who want to engage their children in meaningful learning opportunities. 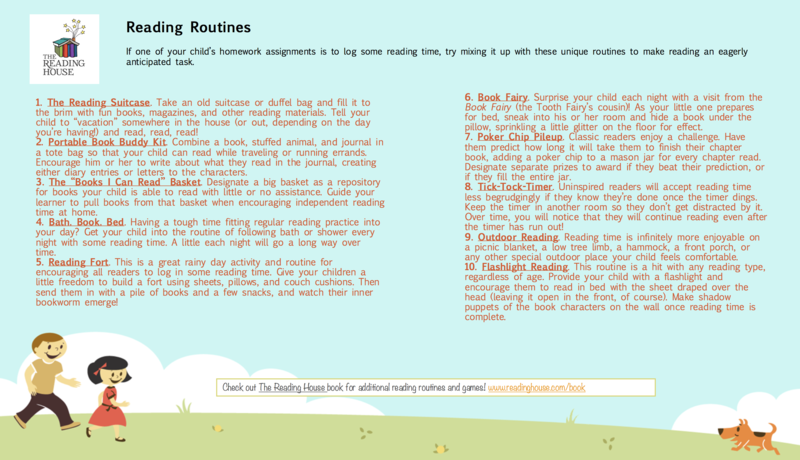 The reading routines and games below are only a few of the 120+ activities in THE READING HOUSE book. Try some of them at home and let us know how it goes. One copy of THE READING HOUSE will be offered as a giveaway through Mommy Has To Work! Please comment below with what your reading routine with your child/children is. Giveaway ends 9/20, US Only. Our daughters read every day after school and then before bed their daddy reads to them. Our routine is my daughter reads to herself 20 minutes a day and my son gets read to in the afternoon and at bedtime! I read my son 1 book, and my son reads me 1 book. We have books in several places in the house and read aloud throughout the day and evening.